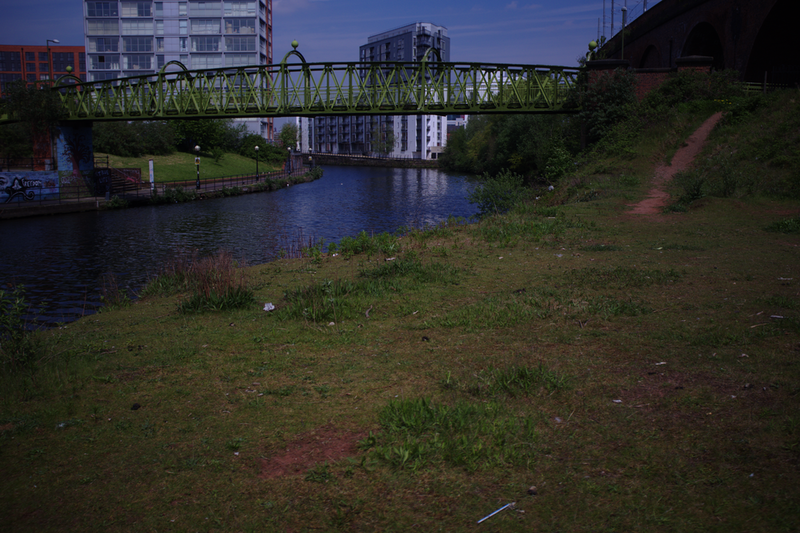 As the Irwell acts as the invisible boundary between Salford and Manchester, Pomona is the limbo that buffers that waterway; it’s the tapering slice of land that makes way for the river to graze the Bridgewater Canal before both waterways abruptly branch off in opposing directions. 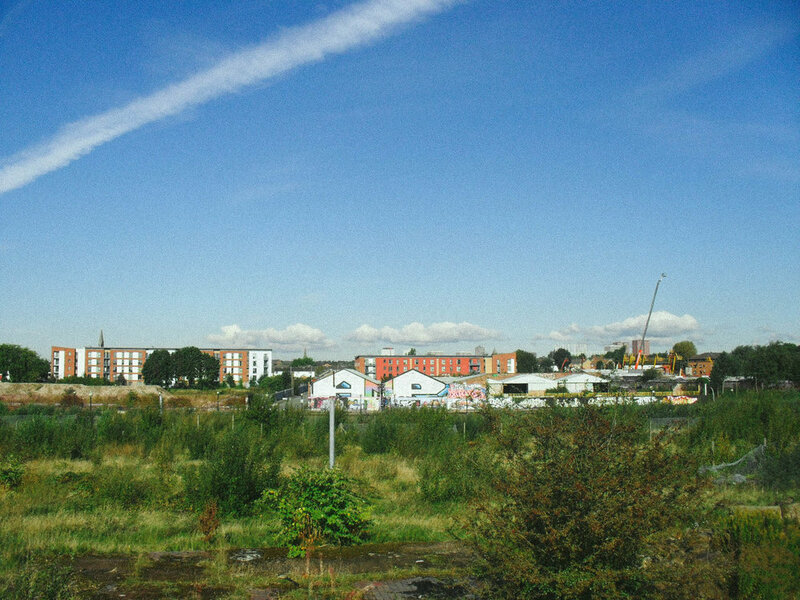 Once a bustling dockland and now a serene wasteland, Pomona, as small as it is manages to straddle Salford, Old Trafford and to a lesser extent Manchester (it takes mere minutes to reach from central Manchester on foot). These edgelands of Manchester are our alternative countryside. Despite this the site has once again sprouted into a thriving green space, in fact the measures taken to clear the site may have created an even more diverse landscape than before with certain species of plant designed to grow only from the sites of fires and clearance, or new seeds having been awoken from dormancy in the churning of the land. A flora report of the area identifies the presence of thirty-three biologically important species including the bee orchid which is listed as rare in Greater Manchester and found only at four other sites. The sprawling grounds of the former docklands, to a pedestrian, are almost completely isolated from bank to bank with only one dedicated footbridge. If you enter the docklands down by the office complexes on the Salford-most side of the canal, you can’t cross from there to the rural open space on the other side until you just about hit Castlefield, but then Pomona’s most recent legacy as the docks to a ship canal were never planned to be traversed by foot or enjoyed as scenery. However, before the docklands Pomona was indeed a tourist destination; a place of leisure unsurpassed in splendour and vitality. Pomona Pleasure Gardens were a major attraction in the mid 1800s, originally named Cornbrook Strawberry Gardens the area was renamed to reflect the lush orchards which surrounded it (Pomona is the Roman Goddess of fruit trees, gardens and orchards). Opened in 1845 by William and Joseph Beardsley, the orchards were eventually converted to public Zoological Gardens and in 1868 the area was sold to James Reilly. Reilly built a palace in the grounds, and he lived nearby in a large mansion. The Royal Pomona Palace was a grand building surrounded by pavilions that hosted the likes of Benjamin Disraeli. The palace was the largest hall of its kind in the country and it acted not only as a place for people to meet and dance together but as a home for political rallies. 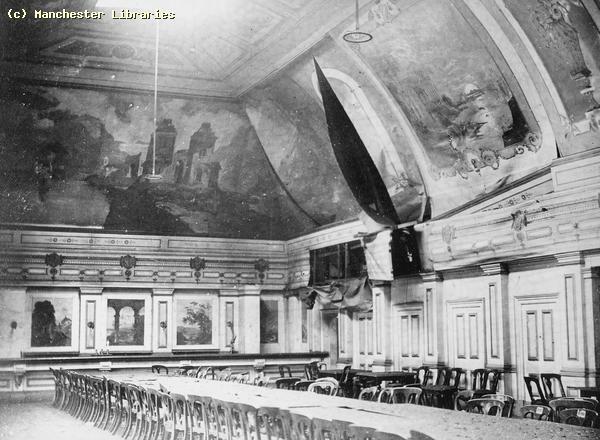 The palace itself housed a 100ft clock tower, an orchestra pit built for 100 performers, and the tea room’s ceiling was painted with figures of Mars, Venus, Neptune, Vulcan and Pomona. The venue could house 30,000 people. To accommodate for members of the public wishing to swim Reilly built a 150ft swimming pool a few minutes walk from the site, besides his house on Tatton Street, Hulme. The palace and the surrounding gardens were marketed to the citizens of the region as the cost effective way to see the countryside and escape the ill air of central Manchester and Salford. The pleasure gardens were accessible by road from Hulme or by steamer or rowing boat from Salford. The grounds hosted horse shows, dog shows, roman chariot races, circuses, entertainment from touring professionals such as Wallett the Queen’s jester, and in the botanical gardens you could take archery classes, ride on the flying swings, explore the hedge maze and try out the camera obscura. Today the area hosts much more nefarious activities; illicit dogfight training and a place to shoot up in private - but that’s not to say it’s not every bit as glorious. The glory of the palace and gardens was relatively short lived, in the 1880s the site was almost entirely surrounded by factories and it had been decided to build several of the Manchester Ship Canal docks on the grounds. The Palace and gardens continued to operate for several more years then, in the summer of 1887, a nearby chemicals factory exploded and in doing so damaged the palace considerably - had it been timed differently repairs would have been made to salvage the hall but as it was the area was under threat and destined to rot away to obscurity: the following year the gardens closed forever. The explosion happened on 22 June 1887 at Roberts and Dale’s Chemical Works, it’s suggested in the fire report of the time that a employee of the works had been drinking at Pomona Gardens over lunch and returned to work and lit his pipe besides the stove used for picric acid. There were two explosions, the first was minor and caused a fire and the second was massive and killed James Martin, an employee who had been trying to put out the fire. It was reported a day later that a young boy named Heled was also killed when the force of the explosion threw the cradle he was sleeping in against the wall of his home. It wasn’t only during the life of the palace that unusual entertainment could be found here. On 10th January 1974 a nightclub was opened by George Evans, only it was aboard a moored ship.Manchester’s first ship club was the North Westward Ho and included seven different bars (including the Binnacle Bar and Pilots Bar), a dance floor and the Canal Room restaurant. The ship was decommissioned as an Isle of Wight passenger ferry due to an explosion in the engine room in 1971. The ship was so popular that later the same year the owners purchased the Dehavilland Comet, an RAF aircraft, and parked it besides the ship to act as an overflow restaurant and dance floor. It was scrapped in 1981. Today the docks that replaced much of the gardens have nearly all been filled in, and once again the land is green and peaceful. Like many areas of Manchester the ground here is contaminated from the waste of factories, it’s this contamination that allows us this expanse of green - one we should appreciate before it is finally developed over. The area is an excellent vantage point of the transport links vital to the success of the city. Aside from the Bridgewater Canal and the River Irwell the giant spine of the Manchester South Junction Railway runs through the former docklands, and trams constantly pass by. The landscape is mostly flat though it changes over on the Manchester side of the canal, towards Castlefield, there you’ll find a strip of railway arches. Some offer a sort of privacy behind the remnants of old facades although the gloom in these spaces soon ushers you out into the daylight. 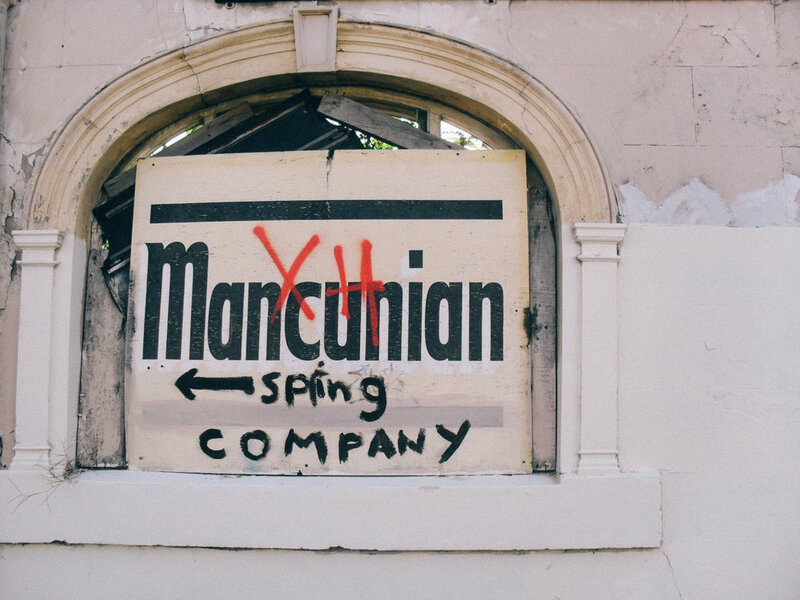 It is in these recesses where many of Manchester’s homeless live. The pathway that runs along this chain of geometric arcs echoes of vanquished industry and is lined with thick grass - greener than anywhere else in the city, a miniature meadowland that gives way to brightly decorated arches pierced with sunlight. Looking to the docklands away from the city you’ll find a curtain of blue and green - sky and grass, a gateway to the water and an open stretch of land. There is another point of interest to Pomona and that is in the hidden waterway - the Corn Brook, one of Manchester’s lost rivers (others include the Tib, the Dene, Hanging Ditch, Shooters Brook, the Duke’s Tunnel). Inside the culverted Corn Brook. Thanks to Gone Eighty Five for the image. If you mention Pomona Palace to anyone today chances are they’ll nod in recognition and point you in the direction of the site of a recently demolished rather insalubrious old pub of the same name. There's a poem by George Orwell in which he writes about standing in a semi-rural landscape, on a fast decaying farm which stands in the shadows of the city and its burgeoning industry. He writes about a time when everything was changing and people who had been raised on the land were now faced with factories and steel. Orwell is in limbo on this farm, looking at what he now realises is a wasteland but both repelled and attracted by the glittering city of technology ahead of him. The poem reminds me of Pomona; how you can stand in a kind of countryside and yet be immediately in the shadow of industry. Pomona feels to me like stepping into Orwell's poem. It is that same ruined farm in that it has been allowed to decay whilst the rest of the city races on, and although Orwell talks about the land as though dead what we know now from countless other industrial wastelands across the country is how they soon go on to flourish. Perhaps if Orwell had stayed stood at the farm gate for long enough he would have imagined a new future as the emergence of new life was born in the ruins. Pomona has amassed its fans over the years - all of whom quietly enjoy the haven of greenery that steals itself away behind the curves of the city's bridges and river bends. Whilst some see the land as isolated and nefarious, the people who love the lost island of Manchester recognise that isolation as a paradise. Among the Pomona appreciators there is a group that have truly left their mark - the graffiti artists. They too recognise the beauty of the desolate. Even if you haven't been to Pomona you have probably seen the building emblazoned with the graffiti "AMP", each letter perfectly nestled among the triangular peaks of the roof they were sprayed onto. Well see how it, and all the graffiti around it for the vast length of the Irwell, now read "Satow"? This was an overnight movement by the graffiti artists of the city, led by Danny LSD, to pay tribute to the death of "Satow WKY" from a drug overdose by tagging over each of their own tags with his. For them, Pomona Island is a larger than life memorial. Peel Holdings who own the land plan to develop on it eventually, and there's no doubt a majority of people who only see the land out of the corner of their eye whilst riding the tram home probably welcome this - believing the area to be nothing but wasteland, but what about campaigning for a more intelligent use of the land? A Mini-Eden Project? 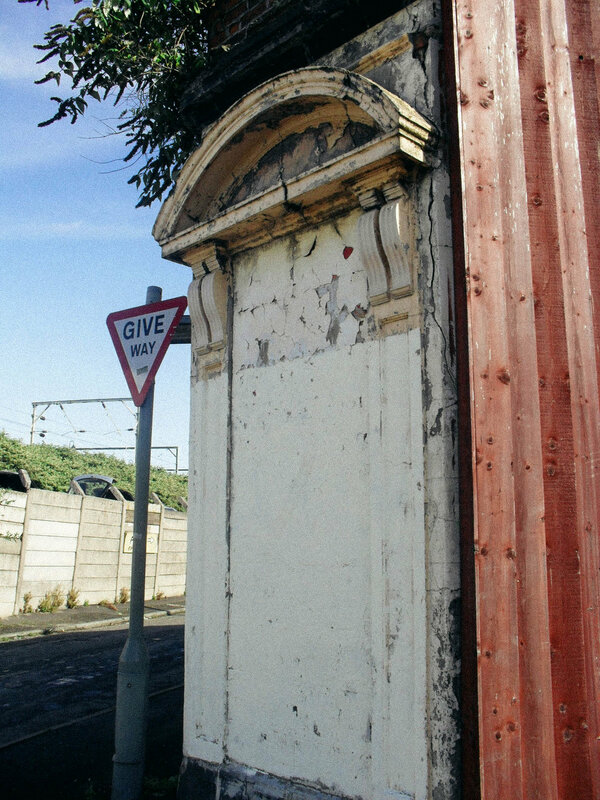 Pomona is the legacy of industry, docks that died and vanished, but before that it was a staggeringly popular location for citizens of Manchester and Salford - it was home to a botanical garden, a palace, a camera obscura, and a place for leisure activities such as archery. It was the countryside within in a city. Now, filmmaker George Haydock (We Are Invite, Generic Greeting Collective) has completed a short film exploring the area and what makes it special. George Haydock: "What fascinated me about Pomona Island is that somehow, through the cracks of hyper-development and regeneration, here lies a totally unmanaged, largely un-used and unnoticed area of land, over a mile in length, just quietly sitting a stones-throw from both Manchester and Salford. It just exists in a strange limbo between its former industrial use, and it’s inevitable destruction and future development. It’s existed in this limbo for 41 years, since the Docks closed. At first glance it does look a mess. However, take a closer look and you’ll see beauty in the chaos. It might seem like wasteland, but it carries a wealth of cultural, environmental, political, historical and philosophical implications. When I began researching it became clear that there is a very niche but varied fan-club of Pomona Island and spaces of a similar nature. I found this range of perspectives fascinating. Many implications and discussions can be drawn from this piece of land – and most people don’t even notice or realise it is there." What do you hope to achieve by bringing Pomona to the public eye? GH: "The Island is home to many biologically rare and important flora and fauna. It’s teeming with life and nature. If the development happens, it will be tragic. Hopefully this film will encourage people to go and take a look around while it still exists. And of course, Peel. As it stands they seem to produce a report every half a year or so with new development plans for the area. The film however, is not political in its intent, making only one reference to Peel. My main intention was to capture the essence of this unusual space, to glorify it, live with it and let it dwell for while. I wanted to celebrate the areas state of limbo – and see it with open eyes. A lot of people who look at the space see and feel nothing, they might see this film and think it’s trivial, but in a way that tension is what interested me. The film is ultimately an attempt to challenge and cause friction against most people’s perspective. For me, film should speak at an intuitive level – and this is what I aimed to do with Pomona Island." Pomona is currently in a state of disarray after Peel sent in the diggers to turn the land over earlier this spring, it's still well worth checking out (and you can see the flowers that have grown from our seed scattering protest!) and I'd advise you do so and love it for as long as you can. Contributors to the film include Richard Brook, Luke Blazejewski, James Walsh, Luke Bennett, Hayley Flynn. Skyliner would like to thank George and the crew from We Are Invite for being such a pleasure to work with during filming and for the chance to premiere the film. Skyliner runs tours of Pomona, if you don't see any scheduled just drop me an email. UPDATE: As of 12th March 2014, shortly after publishing this article stating the area is rife with rare plant life Peel moved their diggers in to the site once again to tear these up. Then in 2016/17 They built two tower blocks on the ‘Ordsall Beach’ end.